The world is full of problems that need to be solved as soon as possible and a lot of defects that need to be corrected. Now the most complicated problem that affects all Europe is about immigrants and refugees, which are often maltreated by some countries, because people think that they are occupying and invading our world. This problem is very serious and I’m a little bit surprised to see that the UN is not doing enough, like it usually does, to solve this dramatic problem. This is what I think about this topic: all these refugees take these mortal boats guided by people that treat them like animals and take advantage of their poverty to drive them to Italy or Spain or Turkey or Greece. During this journey, they cross the Mediterranean sea or better called the Mediterranean cementer given that lots of emigrants died in that sad and angry sea. This means that the emigrants live in extremely bad conditions and that they prefer to risk the death before remaining to live in that hell. They do all of these things to arrive and have asylum status in our countries and if we don’t let them enter, it means we don’t have a hearth to host them, we don’t have a hearth to feel and imagine what they have been through, we don’t have a hearth to listen to the tears of that poor children, which wish to just have a little piece of bread and a place where to live. I am sure you heard about that child who died of a cruel death on the coast of Turkish. He was called Aylan, a little child of two years old that died drowned . 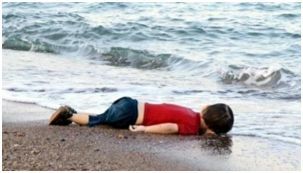 In that photo it seems like Aylan is just sleeping on the waves of the sea, which was very sad for killing him and it was telling him his last tale of goodnight. This photo affected a lot our world and I wish it finally understood that we need to do something today to have an happy tomorrow. Lots of young children die every day at every hour in every moment because of war, emigration, because of our cruel thoughts cause the death of all these human beings. Every problem is a solution and every solution is a problem. This problem is real and complicated, but I know that we can do it giving a hand, a hearth, a home, a smile to these people, which are like our brothers and our sisters.